I decided to try increasing the number of tables that I play tonight. Full Tilt has a limit of 12 cash tables, so I opened up 4 tables on Poker Stars too. It took about an hour to get into the flow. After that it wasn't really too much trouble. I made a little over $700 in 4.5 hours, so not a bad return for the first effort. For now, I plan to continue trying 16 tables for the next few days and see what happens. 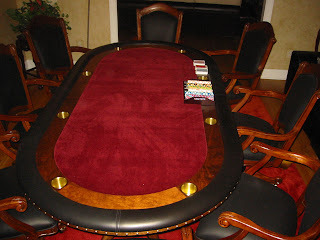 If it goes well then I'm going to add 2 more Poker Stars tables and try playing 18. 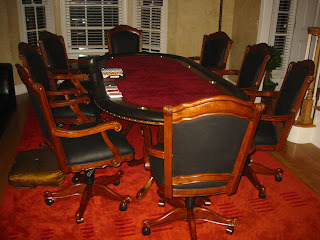 My poker chairs finally arrived this week, and they look pretty good. Hopefully I'll get some mates over next week and start taking their money.... I mean, start teaching them how to play! This lovely picture is of a Jamaican friend of mine who I met when a group of us went to Montego Bay for a lads' holiday. She was the trainee-manageress of the hotel. She was very helpful and most accommodating. Tight/generally winning players I identify by the red mark. Fish have a green mark, and the fishiest of the fish- who don't have a fold button- are blue. Don't forget to put a green mark for Matt Hughes! Can I just say that you're my hero smartmoney. My online poker role model. I want your life!